Home > Archives > Contests > Win Tickets to the April 24 TOO LATE FOR TEARS Screening in Hollywood! Enter to Win Tickets to TOO LATE FOR TEARS Screening! THREE lucky winners will each receive a pair of tickets to the Too Late for Tears screening and release party, presented by Flicker Alley, at the Egyptian Theatre in Hollywood, CA on Sunday, April 24! This screening is part of NOIR CITY: HOLLYWOOD, the 18th Annual Los Angeles Festival of Film Noir, presented by the American Cinematheque and Film Noir Foundation! A cheese and cocktail reception begins at 4 p.m. in celebration of the upcoming Blu-ray/DVD release of our film noir titles Too Late for Tears and Woman on the Run! 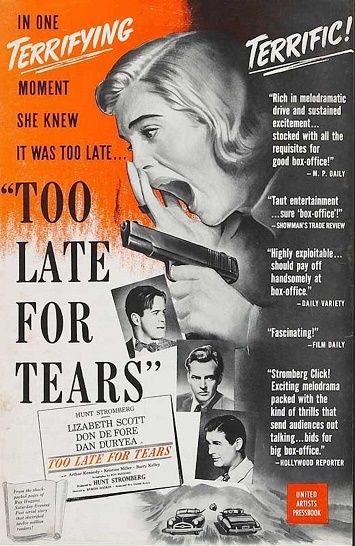 The 35mm presentation of Too Late for Tears, courtesy of the UCLA Film & Television Archive, begins at 5 p.m.! Subscribe to the Flicker Alley newsletter below for a chance to win! And if you don't win, don't worry! You can purchase tickets online here! Bring your friends and family! Don't forget to share your custom referral link for a chance to gain additional entries! See Official Rules link below for details. Giveaway ends 4/19/16. Too Late for Tears and Woman on the Run premiere on Blu-ray/DVD from Flicker Alley May 10! Pre-order now to receive 25% off MSRP while the sale lasts!